Better communication is a key skill that can help you in numerous ways. It helps in articulating the thoughts in an efficient manner. It helps in collaborations, it helps in propagating the ideas and spread the word. 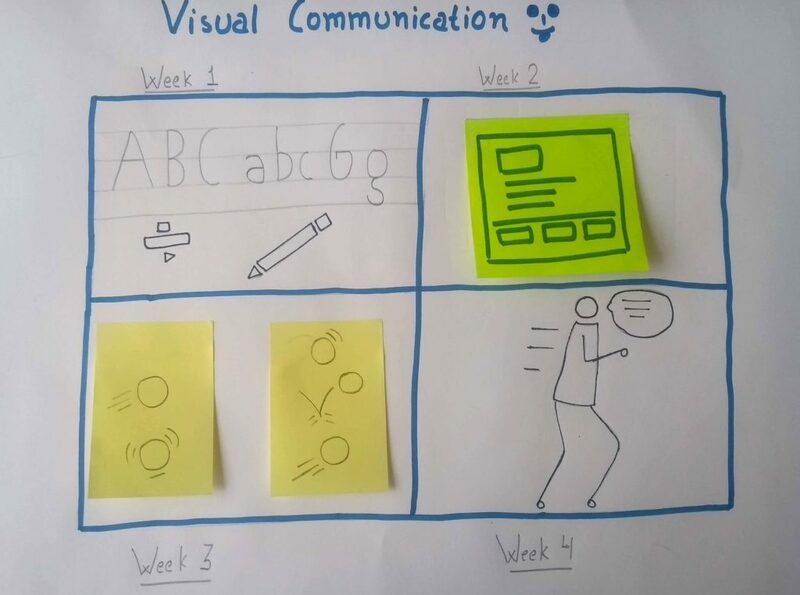 And visual communication is one such means that can aid you better in the quest for better communication. So, on my quest of learning UX design. 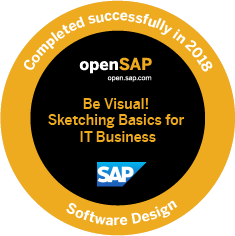 I encountered this course on visual communication, sketching for IT businesses by SAP and it piqued my interest. 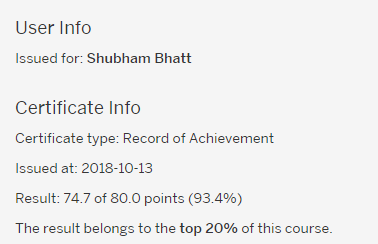 Hence, I enrolled for the course and completed that with 93.4%. Once you complete the course, you get a digital badge, a confirmation of participation and a record of achievement by earning more than 50% of the maximum number of points from all graded assignments. In this info-resource, I’ll be sharing my learnings and what you can expect from this course? Just in case if you are interested in that course, here is the link. Though, the course has ended. Note: I could not find flip chart papers so, made use of a sketching notebook for practicing the first week. How to hold your pen/marker? 1) Hold your pen relaxed, not too close to the tip. 2) Fixate your wrist, hand, and shoulder. Lines are one of the most elementary shapes in sketching and here is how you can craft a better line? How to draw a horizontal line? Push the line away from you as it provides you a firm control. How to draw a vertical line? Pull the line towards you. By practicing frequently, we tend to build a muscle memory. So, try it a couple of times to get hold of it. 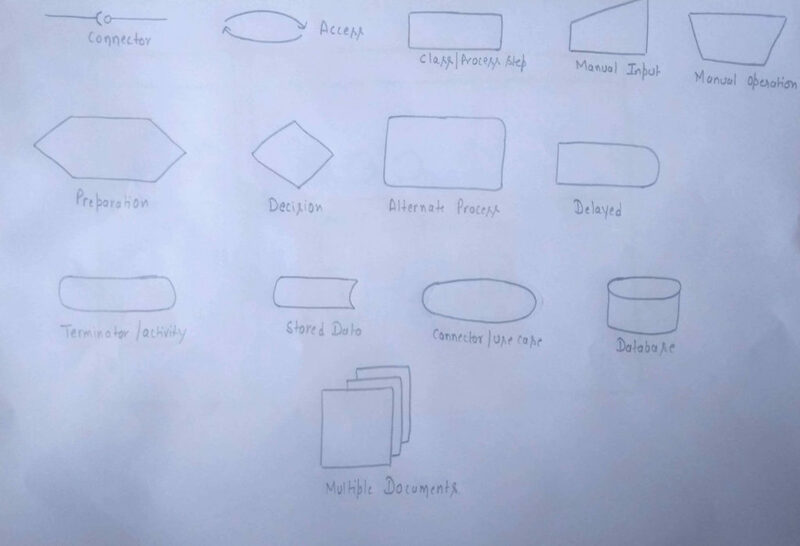 Shapes are called visual alphabets and the single most tip that the course provides is this: close the shapes. The most important takeaway from this week is “Breaking objects apart” principle. Moving on to the writing styles module, here is what you can consider while writing on a flipchart paper. 1) Try to write 3 cm hight characters. 4) Spacing is very important. If it is too spacey and too little spacey then it is hard to read. The rule of thumb is 4-8mm between the character and 15 mm between the words. 5) A combination of uppercase and lowercase is much easier to read. Round tip marker creates a more or less uniform stroke. Chisel tip marker helps to create a thick and thin line. Pro Tip: To create a moderation font, hold it at 45 degrees with the tip pointing downwards. This week was all about flow charts and screen sketches. As evident from its name, flow charts are used for showcasing the flow of an application or a process or a logical entity. The highlight of this week was this tip. Very often when we make a flow chart we tend to make the shape first and then write the text. Too often what happens is that we run out of space because the size of the shape is not enough to accommodate the text. 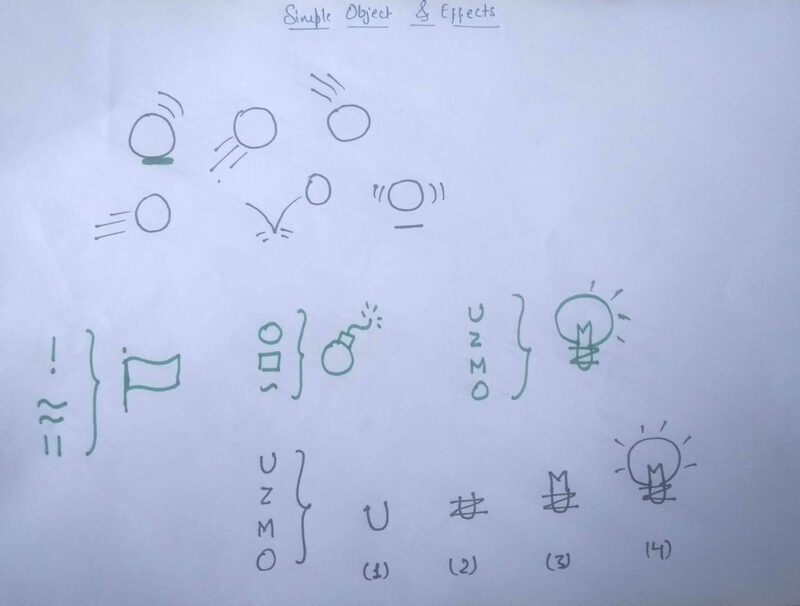 To avoid this problem, always write the text first and then draw the shape. However, the decision box is an exception to this rule and is made this way. Wireframes are simplified sketches that show the content and the layout and the interactive elements of the application. Wireframes show the functional requirements and don’t include discussions about colors and styles. Wireframes help in getting a common understanding of what the application is going to look like. Next, there were screen design basics like why to use responsive design and how it works. 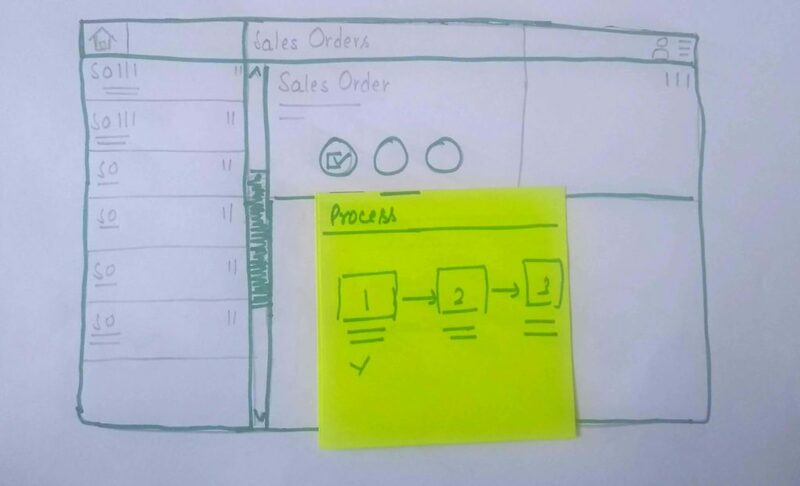 What a master-detail layout looks like and using post-its for rapid prototyping. And that was it for week 2. To effectively communicate, One should be familiar with all the weapons in his/her armory. One should know when to use post-its, flipchart papers, A4 sheets, and whiteboard. Use post-its for rapid prototyping and collaborating. Say, for example, you want to show a tab-based section where clicking on one option results in that particular section, then at that point in time, you can use the post-its. Use A4 sheets when you need flexibility and need not present your sketches to a huge set of teams. A4 sheets are useful because you can easily pass them on. Use Flipchart papers when you want to present something static like Agenda of the meeting. Use whiteboard when you want to discuss ideas with a team, basically when you want to brainstorm an idea together. Peel it from the side and stick wherever you want. Make sure that you can read the post-it from a distance. Consider uppercase and lowercase writing. To present to an audience, go for a thicker pen. To be very precise, go with a thin pen. Before writing on a flipchart paper, test the layout on a small paper first. Once you have an idea of what content needs to go in and then start with flipchart paper. Use post-its for the things that can change on the fly, for example, the last minute change in the agenda of the meeting. The rest of the videos were about creating simple objects and effects with the help of lines and all. 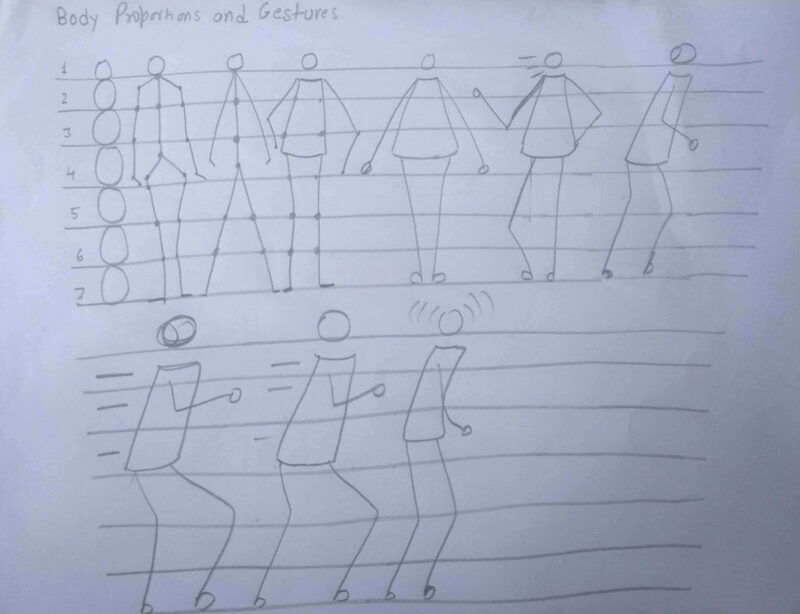 Storyboarding is helpful because we want to solve human-centered problems, so we often need to visualize people, what they are doing, saying and behaving in certain premises. The next section was about face and proportions. 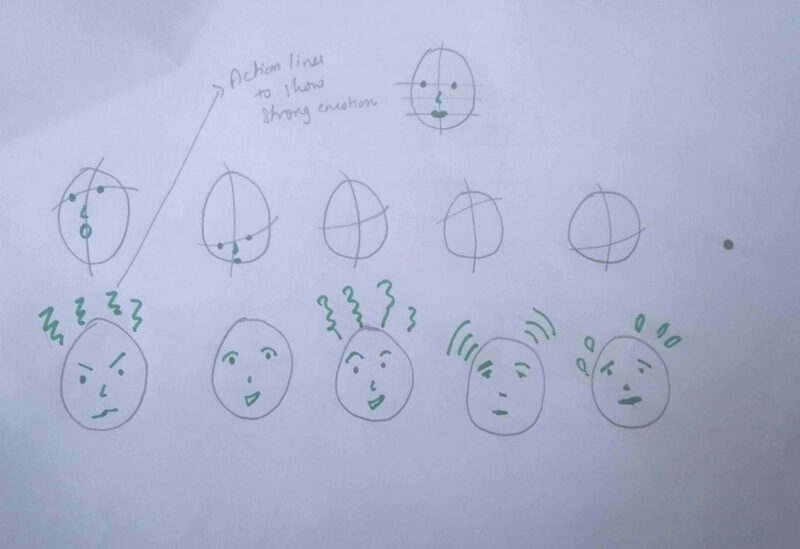 The thing that can be learned from that module is that in order to make a face look in different directions, imagine the face as a three-dimensional model. The human body of an adult is typically seven heads high. A chest is two head high. 1 head for the hip. 1 head for the legs. Knees will be halfway along the legs. Elbows should come just below the leg. When finding it difficult to visualize a certain posture or gesture, either do that posture yourself or google images. Don’t try to imagine hard. Stories are a very powerful tool for communication. Stories put the human face on abstract data from the user research. Also mentions the story arc curve. The rest of the week was followed up by a storyboard exercise and eventually a goodbye video. I really hope that I am able to justify with the learnings of this course. The main intention to write this info-resource was to let you know what you can expect from this course. Ideal for those who are starting their career in UX Design i.e. Beginners. Ideal for those who are into enterprise industries, working in big teams where they have to present their ideas in front of an audience quite frequently. 460 learners earned a record of achievement. 3,649 learners were enrolled on day 1 of the course. When the course ended, this number had increased to 4,939. Thank you for taking out your time and reading this. Do let me know if you have any doubts, unfortunately, this course is closed. So, if you are willing to enroll in this course, you will wait for some time. I’ll keep this thread open for updates. We send a newsletter once a month with the latest UX updates and resources.